A holiday of a different kind, good for the soul, one that would be more familiar to my parents generation, is Donnelly River Holiday Village in the south-west of Western Australia. The village is no longer a town, however, many years ago it used to be a timber mill town (built for the Bunnings Brothers), and then it was abandoned and now it is a charming rustic holiday village. The old school has been converted into a backpacker’s dorm. The butcher’s shop is a TV room for kids. The general store is a small cafe. The old mill stands hauntingly in the background and the general store has some good reading material about the history of a timber mill life. 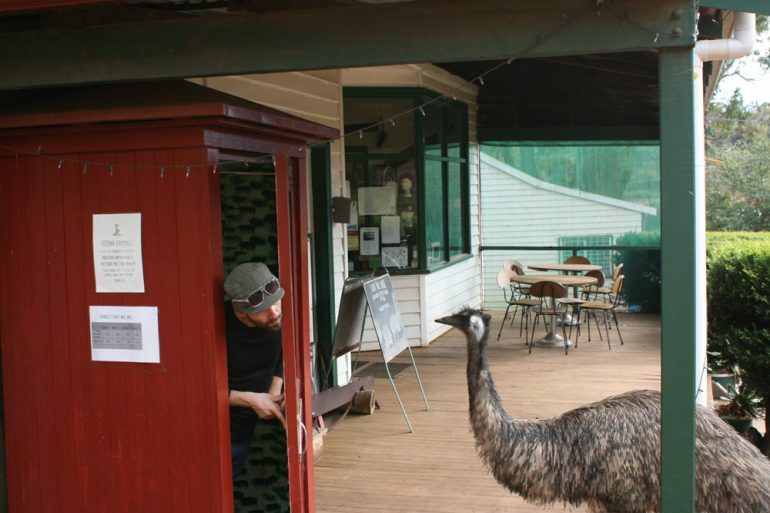 The issues you will face at Donnelly River Holiday Village is overly curious kangaroos and emus, birds that visit the veranda at sunset and eye your cheese and crackers, no wi-fi or phone reception, chopping wood for the fire and over nighting in quirky old mill cottages with out toilets and creaky doors. A neighbour may knock on your porch door and offer you some pizza, gasp. Washing dishes using separate hot and cold water taps could also send your head into a spin. The oven may take a while to fire up. The flying fox is at your own risk. You’re in the middle of a forest, far away from the city. There is little luxury or modern conveniences to keep you entertained. Sounds horrible? Truth is, Donnelly River Holiday Village was one of the most relaxing holidays I have been fortunate to experience. Mountain biking the Munda Biddi trail through thick forest and sitting by the fire in the evenings with a good read and a local red. Waking up to the loud bird noises and discovering that bird watching is seriously fun! Being able to stop and admire the night stars. Looking up into the tall forest. Seeing kids making up their own adventures – one day we spied a little boy riding his bicycle with a stick wedged into his belt, which we imagine was a great sword of some sort. Photo Diary of Donnelly River Village can be found here. This post joins up with the A-Z Guidebook Travel Link Up hosted by Tiffin Bite-Sized Adventures. Thank you Fiona, I’m glad I made this month in time and looking forward to the others! This month letter is D.
This is a very accurate review. Donnelly river is the most beautiful, amazing and relaxing holiday I have been fortunate to have. Personally I think this holiday can be equally as fabulous if you gather some friends, hire a row of houses and have a week of long nights surrounded in nature, fauna and laughter. Kids love Donnelly and reconnect with nature; discovering a astonishing world away from technology. This sacred in the forest is timeless.